Up till now, I’ve tried to remain completely dispassionate about Aetogate, restricting my public comments to statements of fact and reports of what others have said. In particular, the site that I maintain linking to other people’s commentary on this issue contains no opinions of my own (or at least, if any have leaked through, it’s been inadvertent). But now that the SVP has released its findings and others have had a month to make their own comments in response, I am going to use SV-POW! to say it how I see it. (The fact that the SVP’s so-called “permalink” has changed in the last few days, if you can imagine anything so dumb, may itself tell you something.) [Update, July 2013: it’s changed again, and this link is now a 404.] [Update 2, October 2015: I made my own copies of the SVP documents, in case they vanish permanently] For brevity’s sake, I’m going to concentrate my comments on Bill Parker’s case, but most of this also applies to Jeff Martz’s case. Please note that I am speaking only for myself here. (That’s why I am putting this on SV-POW! rather than on the Aetogate site, which remains an objective summary of the case and its coverage, with no opinions expressed.) Matt and Darren have not even seen this posting, let alone agreed to it or contributed to it. The EEC just demonstrated vividly that Lucas can get away with anything, and they practically declared open season on Parker and Martz and anyone else who dares speak up about this. By blaming the victims, or at least by allowing Lucas’s blaming of the victims to stand unrefuted, the SVP has left Bill and Jeff in a worse position than they were in before all this started. Back then, they’d only had their work stolen. Now, they’ve had their work stolen and have a wholly undeserved reputation as trouble-makers. In effect, the SVP have shown that all those people were quite right who warned Bill and Jeff not to get involved, just to lie down quietly like good little boys and not to think they could go up against The Man. To be sure, I am quite certain that was not the SVP’s intention; but when their statement leaves Stuart Ashman of the New Mexico DCA enough wiggle-room to express “appreciation and satisfaction with the Society’s conclusions regarding these allegations”, and when The Santa Fe New Mexican can interpret the SVP statement as “a completely independent body has cleared the scientists of plagiarism”, there seems little point in pretending that’s not how it’s being read. In light of this, what can be done to prevent repeats of the transgressions? It’s almost impossible to say. The SVP’s Executive Committee statement on Aetogate suggests on one hand that it’s Bill’s fault he got claim-jumped because he didn’t tell the NMMNHS people enough about his work, but Jeff’s fault that he got plagiarised because told them too much! It’s tempting to conclude that the only safe approach is to keep your dissertation completely secret, let no-one know what you’re working on, and not even to hint about its contents in your published work. Faced with conflicting testimonies, the Ethics Education Committee was not able to resolve these allegations in favor of either side, a position that does not absolve either party of responsibility. Parker noted that he expressed his intention to publish on the new genus in a number of venues (abstracts, talks, other papers), but Lucas et al. state that they were unaware of his intentions to publish a new name. Just think about that. Provided you are an established vertebrate palaeontologist, you may read papers written by a graduate student from another institution, publish them in your own in-house journal, peer-review them, and even comment on the taxonomic reassignment in the peer-review, and STILL claim that neither you nor either of your two co-authors took any of the six opportunities IN THE LITERATURE ALONE to understand that the grad-student in question plans to reassign the genus. You can claim this, and the SVP will believe you. I have to ask: is there anything Lucas could have done that would have forced the SVP to recognise wrongdoing? Short of a signed statement, I can’t think of anything. And even then, all it would take would be for him to say “I never signed that”, and the SVP would no doubt conclude that “faced with conflicting testimonies, the Ethics Education Committee was not able to resolve these allegations”. Which is why I am fully resigned to seeing a one-pager in the next NMMNHS bulletin about the Tendaguru brachiosaurid that I’ve been working on, and assigning it to the new genus Rioarribaposeidon. Lucas knows that the SVP won’t pronounce guilt, so what’s to stop him from taking his revenge on me in this way? After all, I only have one widely available abstract to point to in establishing my priority. If Bill’s three papers, two abstracts and thesis weren’t enough, what chance does my poor abstract stand? The EEC may get some teeth for dealing with these cases in the future. Even if they actually can’t or won’t do anything now, someday the extremely naive people running the show will be replaced by a generation of people who lived through this when they were still students and felt helpless and abandoned, and maybe THEY will do something about it. But is that really the best we have to look forward to? It’s a pretty depressing thought, but I suppose better than nothing, to think that the generation of future VPs who are being born right about now can look forward to working in a cleaner field — one where professional ethics isn’t just something that we talk about. So I have to conclude by saying that the SVP really dropped the ball here. They had an opportunity to send out a clear message: “You may NOT take advantage of less established scientists by plagiarising their conclusions and claim-jumping the taxa they recognise, and anyone who does will find us coming down hard on them.” The good news is, they did send out a clear message. The bad news is, it was “Feel free to plagiarise and claim-jump. And you victims had better keep quiet about it, or we’ll say that we Can’t Absolve You Of Responsibility”. How could the SVP committees do this? 1. They are too dumb to understand the very straightforward and overwhelming evidence in the freakin’ published literature for goshsakes. 2. They’re too cowardly to admit to what it means. 3. (I mention this only for completeness), They’re too corrupt to respond to what they see. Even if we discount possibility 3 (which I think we can, and which I am very happy to do), I am still left horrified by either of the first two possibilities. I truly don’t know which is worse. Now let me be clear that I have nothing but respect for the individuals who make up the SVP Ethics Committee and Executive Committee. Whatever’s happened here, it’s obviously akin to a Dilbertesque committee effect: it’s said that the IQ of a committee is that of its least intelligent members divided by the total number of members. But I would really, really, really like to hear from those individuals. I’d like to hear some explanation of how we ended up in this ridiculous state where Bill and Jeff are actually now worse off than they would have been if they’d kept as silent as previous victims (whose wisdom, if not courage, is now shown to have been greater than Bill’s and Jeff’s). Please, committee members, comment on this blog. We’re all waiting to hear your explanations, and longing for them to be good. 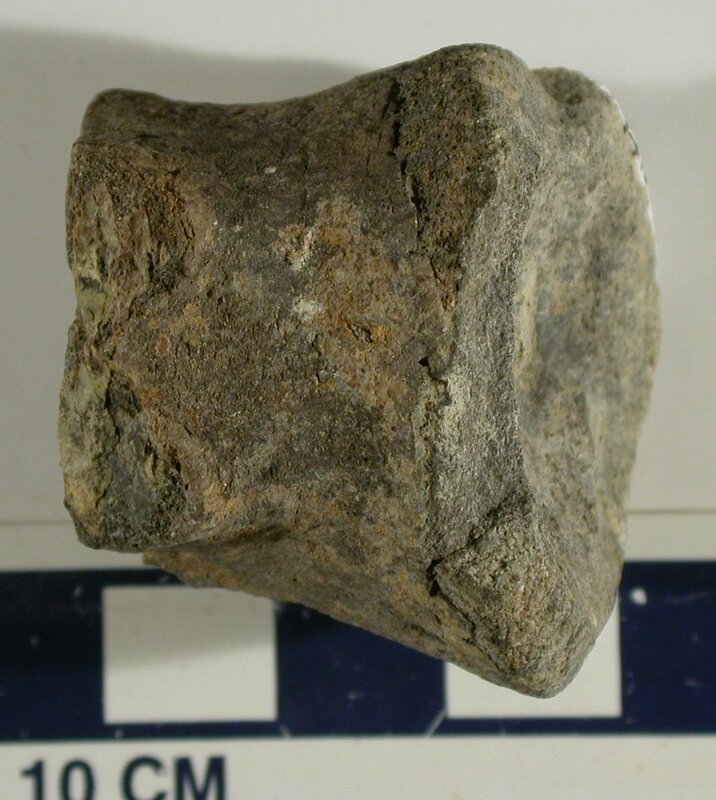 Oh, yeah, and here’s a sauropod vertebra. The Aeteogate saga has actually repelled me from the field. I once had some hope of someday going to college or grad school, leaving the state if need be, to get a degree in paleontology. Specifically taxonomy, which I love. However, I’ve had a lot of bad experiences with “professionals” who clearly look down on their grad students and younger colleagues. Horner gave a talk about T.rex up here and said that digging around in the rock and doing the hard stuff is what “grad students are for.” One of Alaska’s retired paleontologists, Roland Gangloff, had a bad reputation for signing his name over his student’s works in publications. And then Aeteogate. And these can’t be isolated incidents. I’ve sadly come to the conclusion that American paleontology is run by a bunch of “good old boys” who grew into the profession during the 60’s and 70’s, and look out for EACH OTHER rather than helping the new generation(s) rise to prominance. I would MUCH rather publish books for a “popular” audience than work within the community, which seems preoccupied by dog-eat-dog politics and misplaced loyalties. I know I’m being cynical, and maybe I was just really naive, but the whole experience has been an eye-opener. I was disappointed by the SVP’s condemning of everybody blogging about the event. How can there be any harm in meaningful conversation about a controversial issue? It’s like Bush telling everybody to not discuss Iraq for the first few years of the war. Mike, this has been such a heated topic that has left so many with mixed feelings, and I understand the way you feel. I know all but one of the committee members as individuals also. I really do not think they fall into any of the categories, but I do think they were backed into a corner. I was not entirely thrilled with the results of their inquiry either. But I do feel bad for everyone (well almost everyone) involved in this, including the committee members. I wish they would have been a bit more direct in their findings, and I do worry what will happen in the future. Your post makes many many good points. Did you happen to see the press release SVP posted on the 8th? “We encourage all SVP members to discuss ethical concerns amongst themselves. In this particular case, however, private correspondence was made public without the permission of either sender or recipient, which put the ethics education committee in a difficult position. As public discussion increased and involved more people, so did the chance that members of the Ethics Education or Executive Committees would be placed in an inadvertent (and avoidable) conflict of interest and be forced to limit their involvement in the case. Care must be taken to ensure that “open communication” does not derail efforts to remain comprehensive and impartial. I think the face-to-face discussion is a very good idea. Is it to late to try and pull something together like this for Cleveland I wonder?? The committee’s job was probably made much easier once it was clarified to them that they would not be allowed to do or say anything more substantial than “tut, tut”, and then only if they said it to everybody equally. It will be up to “all of you” to police the profession yourselves, however you can. My brother is an airline pilot; he carries around a xeroxed list of picket-line crossers, and refuses to share a cockpit with them. Creating a “society of ethical paleontologists”, with membership by invitation, with various probably symbolic benefits for members, could help, but only if carefully designed so it could not be subverted from within, or become toothless. (Restricting leadership positions to grad students might help.) This problem has come up many times, historically. There must be a lore of how it has been addressed successfully. I’m a lawyer by training and at work regularly deal with an administrative tribunal and from that perspective the SVP EEC’s decision is shite (some law latin there). Technically speaking, it was unreasonable, because the decision did not address the evidence Mike noted above. They simply dismissed it in the face of one party’s claims. If courts and tribunals did that, they’d never find against anyone, and that is clearly the upshot of the SVP’s decision. Plagiarize and claim-jump and as long as you’re not dumb enough to admit it in public you’re safe as can be. The entire lack of thought (and re-reading before publication) is shown by the way in Parker’s case, they claim they don’t absolve either party of responsibility, they only criticize Parker. Mike, you sound pretty bitter about this. I think you’ve good reason to be. Oh, and I’m way too much of a layman to be able to identify that vertebra beyond a guess it’s a caudal. What is it? LOSLISTC* I only just noticed the tag “stinkin’ mammals”. Apropos. Even before the SVP’s decision came out I figured it really wouldn’t matter what they said. With all the relevent information from both sides presented online, everyone’s just as well qualified to judge the case as the Ethics Committee is. And from the e-mail correspondence (which I think was a good thing) and informal conversations, most people seem to be on your side. So while there wasn’t any official action against Lucas, I’m sure his relationship and reputation with the rest of the vertebrate paleontology community will suffer due to his actions. Yeah the NMMNH got away with naming an aetosaur, but at what cost? I had actually hoped for an outcome that could have pointed to what seemed to me to be some wrongdoing. Instead we got a case where students could be plagiarized unless they silenced themselves, and it would be their fault, and in fact very little was said to those who would plagiarize the work of others. We are left where if one discusses a thesis with workers who could plagiarize it, you had better start producing and apparently publishing the correspondence, get signed statements, photos of interactivity, log records, etc. to back everything up. Legal deniability is what favored one side to the point they could declare themselves victorious. I feel a sense of righteous indignation that work I have produced and placed on the internet would be exploited and stolen for the sense of acheivement for others, and have withheld some of my conclusions for my work because of it. Yet without discussing this, I cannot progress without being able to move about. This makes it extremely difficult for me to make full acheivement of my interests while also trying to keep my trap shut. My work must be public to other institutions just to access their work, as is apparent Lucas requires of others to even touch the NMMNH collection. Zach, don’t let Aetogate — neither the initial incidents, not the SVP’s inadequate response to them — put you off being involved in vert. palaeo. The field is full of wonderful people who do fantastic work and want to see others succeed: I have met far more of these than I have of … the other type. If people like you give up now, then The Terrorists Will Have Won. Mike from Ottawa. Nail, head, wham. And, yes, it’s a partial distal caudal centrum: one on the most boring sauropod vertebrae I’ve ever seen, and yet, oddly, one on which Matt and I (and a third co-author) will shortly by publishing. Mickey Mortimer: I like your optimistic view of things, and the sense that the (lack of) SVP verdict may not be as important as we think. But, really, if the SVP Ethics Committee doesn’t have both the mandate and the expertise to reach a verdict on this kind of thing, who does? Jaime: So, so true. And yet, do you really think that signed statements, photos and log records would constitute proof to a committee which has shown that it doesn’t think published papers are admissible evidence? *sigh* I really must stop getting worked up about this. The SVP decision does seem disappointingly weak, but matches a sadly-familiar pattern nowadays: of face-saving, unwillingness to stand up boldly for principle, and of reluctance to acknowledge evidence that shows one side really is clearly right and one side wrong. Moral relativism, cowardice, fence-sitting. Is there something about being on a committee that induces atrophy of the spine and forebrain, and bifurcation of the tailbone? Paradoxically though, I have found personal comfort in the Aetogate saga. During the past year I’ve (with others) been pushing for openness and change in a certain small charity with which I’ve been involved for 9 years; a charity where (after some key appointees left suddenly in rancor in 2007), ordinary charity members who had questions to ask were invited to submit them in writing to such-and-such-committee. After I submitted thousands of words of observation, inquiry and comment without reply – even when I asked, plaintively, for ANY response (was my writing worthwhile, or was I totally wrong?) – still, no official reply. Finally I collared two of the committee members face-to-face, and in several hours of discussion they admitted that yes, my points had validity, but no, not even 5minutes in 9months of committee meetings had been spent by them on jointly considering the content of my submissions. Partly I was challenging the soundness of decision-making and suggesting domineering practice by the leading officer of this charity insufficiently-checked by others. He has now stepped down to move elsewhere, and been replaced; his replacement, I am glad to say, has a much healthier ‘team’ approach. Nevertheless there still seems a reluctance to admit facts or hold anyone to account. These are all people I personally know, which has made it a very uncomfortable time. Knowing that other people (you guys) were challenging shoddy practice you saw with thoroughness and integrity – Aetogate, running in parallel – has helped me not to lose heart. It’s not in vain to take a stand, nor done alone. Cheers! I pretty much agree with all of the above. I was surprised to see the EEC side against public discussion of the case. It smacks of “We will tell you what to think about this case,” and removes any way of evaluating the quality of the EEC itself. Now that really sends my ethical hackles skyward. I can’t even begin to imagine how badly you must have felt having to keep your opinion bottled up for so long. Especially seeing how your and everyone else’s efforts just met a stone wall at first, then then a rubber wall of noncommittal and siding with the powerful. Pity – the SVP EEC had a chance to set a precedent, and they miserably failed to even get their thumbs out on the simplest issues! Why not say that ‘the published record of events indicates an unfortunate oversight by Lucas et al.’ – that would have been the only FAIR was of letting the perpetrators down easy that the palaeo-public (professional and amateur) could live with. Instead, they blame the robbed for what – doing proper research? As has been pointed out, simply working in the field involves a lot of times when you have to share ideas, data, access etc. with colleagues. I am right now sitting in the lab of a colleague from whom I could in ten minutes pilfer enough stuff to do my doctorate three times over. He can’t publish this stuff rapidly, if he wants it to be thorough, so if I just want to scoop him and do not care about quality, I can. Easily! So the guys robbed of their well-earned rewards in the aetogate scandal should have done what exactly? What does the SVP EEC say about what they should have done? Talk about it, keep quiet about it. Tell Lucas, keep Lucas in the dark. Request written permission to publish, but keep exactly WHAT they want to publish (‘Gee, it’s a different, new species’) to themselves? Let’s imagine that scenario for a minute. You’re a researcher, coming to visit a museum, and afterwards you write the curator: “Dear Sir, your fossil coll. #12345.9876 is interesting, and I request permission to publish on it. Sadly, the SVP EEC told me that I can’t tell you why I want to do so, and what I think is so special about it. If I did so, I’d be to blame if someone scooped me. Now how is that curator guy going to respond? I’ll leave all readers with that question. @Jamie: perhaps you remember me from SVP a few years ago. I was the guy saying you were so much younger than your internet posts sounded. As for your comments above: been there, done that. A certain piece of publicly available writing by me contains certain intentional errors/inaccuracies/weird things and leaves a LOT of stuff out, just so that I have something left to publish ‘in case’. A shame, isn’t it? Mike, as you know I pretty much agree with the gist of your post. The good news is that there is a fourth option to explain “How could the SVP committees do this?”, namely: The committee members were of split opinion, and as a result struck a “compromise” position (which is very different from a consensus position) and the result is the garbled and sometimes contradictory statement they released. Since the Ethics Committee was in all probability made up of individuals who are niether stupid nor particularly cowardly, but almost certaqinly had different histories/preconceptions of the individuals involved in the compliant, I suspect that option 4 is the most likely. Even in the “dispassionate” world of evaluating scientific hypotheses we’ve all seen cases where someone’s opinion of the researcher outweighs the research itself. In the more emotionally-charged sociopolitical realm off affixing blame when careers are at stake, how much more natural must it be to trust your gut on who is to blame with conflicting testamony? So while I agree with your take on the series of events in question, I think the committee’s failure to come to the same conclusion is due not to malfeasance, incompetence, or fear, but rather human nature… a flaw that is largely unavoidable. Mike, those people who advised Parker and Martz to not stir the waters of this murky pond clearly understood the nature of the beast it contained much better than those who advised them to plunge in. But having followed this case closely and having now read the EC’s findings, it seems to me that by failing to reach a conclusion one way or another, the EC achieved exactly the political objective it needed to reach, however unsatisfactory that was to those looking for a simple yes/no answer. Moreover, I don’t believe that this outcome automatically indicates that its members were either cowards, or that they failed to understand the strength of the evidence presented to them. Nor do I think the EC was ncessarily faced with a “split vote”, or was composed of “good guys” vs “bad guys”. If Lucas and his co-workers had been found guilty of plagiarism, it could have been the catalyst for a flood of similar accusations, because it is inconceivable that Lucas is an isolated case. Others must certainly have crossed the line with regard to inappropriate use of other people’s research and discoveries. Perhaps some such misdemeanours were already known to members of the Committee, even as they were considering the case against Lucas. If Lucas had been publicly castigated, who could say how many more skeletons would come tumbling out of the closet? I am sure this was an outcome the EC could not possibly have countenanced, nor wished to be held responsible for. As a result, whatever private reprimand may have been sent to Lucas by the the EC, there never was going to be any other public conclusion than the one that it eventually reached – i.e. none at all. But if there is any comfort to be drawn from this affair, it is surely that a line has now been drawn in the sand. Aetogate, the EC’s publications on the matter and the extensive surrounding publicity have pretty much ensured that the next time a charge of plagiarism is brought, it cannot be ignored or quietly dismissed. The EC, despite its lack of a satisfactory conclusion from the perspective of the plaintiffs in this partivular case, has fired an effective warning shot and given everybody in the Vertebrate Paleontology community a chance to get their house in order. It would be a very brave or foolish person indeed who ignored that warning now. Whether Parker and Martz, think it has all been worthwhile is a different matter. I’ve sadly come to the conclusion that American paleontology is run by a bunch of “good old boys” who grew into the profession during the 60’s and 70’s, and look out for EACH OTHER rather than helping the new generation(s) rise to prominance. And, yes, it’s a partial distal caudal centrum: one on the most boring sauropod vertebrae I’ve ever seen, and yet, oddly, one on which Matt and I (and a third co-author) will shortly by publishing. Et hop ! into my quote collection. But if there is any comfort to be drawn from this affair, it is surely that a line has now been drawn in the sand. Aetogate, the EC’s publications on the matter and the extensive surrounding publicity have pretty much ensured that the next time a charge of plagiarism is brought, it cannot be ignored or quietly dismissed. The EC, despite its lack of a satisfactory conclusion from the perspective of the plaintiffs in this partivular case, has fired an effective warning shot and given everybody in the Vertebrate Paleontology community a chance to get their house in order. It would be a very brave or foolish person indeed who ignored that warning now. I wholeheartedly agree. I think the implicit emphasis on the Common Law tradition, where precedents are legally binding, is completely unwarranted. Bulletin have left the authors vulnerable to the appearance of impropriety”! SVP bears responsibility for allowing this interpretation, certainly, but we shouldn’t ignore the power of the the popular press to inform or misinform those outside academia. Witness the links, for instance: in August 2012, the Santa Fe New Mexican story still appears at the Web address provided here – while the SVP has scrubbed its ‘permanent’ link to the findings yet again (I had to go diving in the Internet Archive to find the executive summary). As a result, anyone seeking independent and reliable secondary sources on Aetogate will easily find an incomplete story that presents the findings as unequivocally in favor of one party in the dispute. Retrieving the actual findings? Not so easy. You are right, Don, that the popular press had as important a role in forming public opinion as the SVP itserlf did. The difference is that the popular press owes nothing to the palaeontological community and exists solely to sell newspapers. The SVP is supposed to represent the interests of its members and of the discipline. It did neither. So, yes, it would have been nice if the popular press had spun the deliberately ambiguous findings differently, but there is no particular reason to have expected them to. But it would have been even nicer if the SVP Ethics Committee had grown a pair and reached the conclusion that all the evidence so very clearly pointed to — since that is its only reason for existing. It failed in every way.